Owning a dog is a great responsibility, especially since it requires feeding, bathing, walking, and constant pampering. Not to mention all the tools, equipment, and accessories you will need to keep it safe and happy. If you’re looking for a product to preserve its food fresh for more time, you should invest in a good food container. 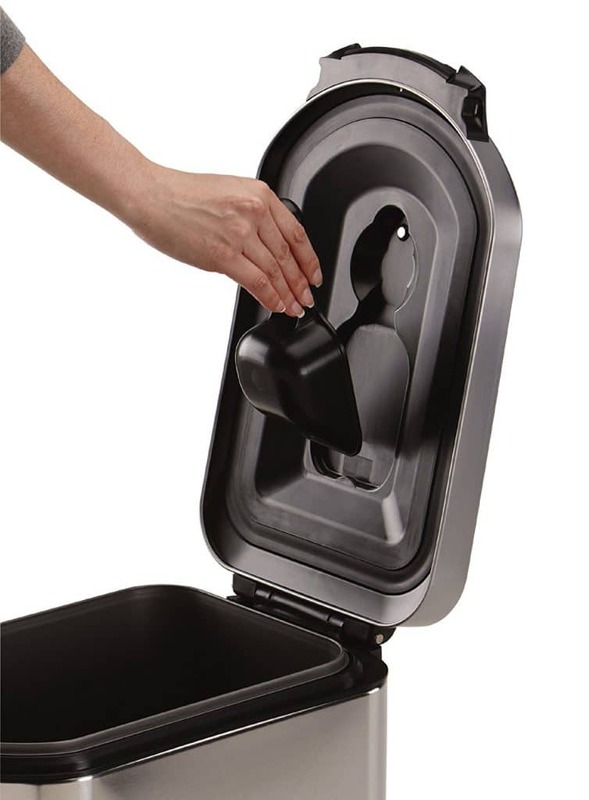 In our opinion, one of the best dog food containers is the Simplehuman X-large because it has a storage capacity of 40 liters, provides an airtight seal to keep the food fresh for longer, and comes with built-in wheels for easy handling and transportation. 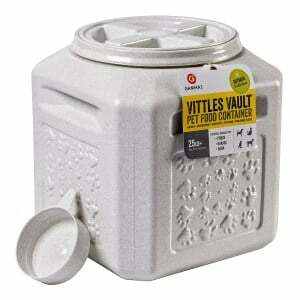 If the Simplehuman X-large container is not available for purchase, you should also consider the Vittles Vault Stackable as a reliable alternative. The lock-tight handle will make it easy to use this option and it will shut to prevent pets from opening the lid. 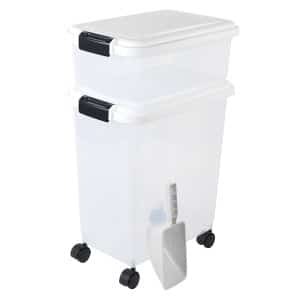 It comes with a lid-mounted scoop, fingerprint-proof finish, and built-in wheels to make moving the container much more manageable. While not a problem with the unit itself, a few customers reported problems with shipping, complaining that their unit arrived in with dents and scratches. If you have the budget for it and you are looking for a premium option, the Simplehuman model offers a unit that is built using high-quality materials to offer you and your dear pet the experience you both deserve. 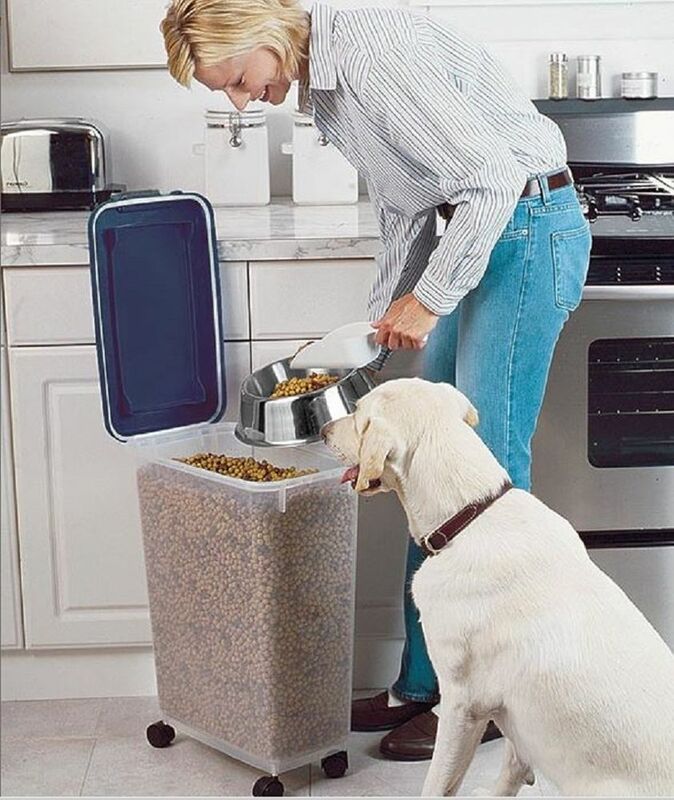 This 80-pound option offers ample room to store all your favorite dog food. The airtight seal will keep food fresh for longer and it will also keep pet food odor contained in the vault so that your dog doesn’t feel constantly drawn to the food container. The rubber lid that keeps the unit airtight falls off easily which makes it easy to lose if you are not paying attention. It can also be hard to find a proper replacement. This nifty option is bound to make the life of any owner a lot more comfortable, as the food will remain fresh and the heavy-duty design will keep pets away from grabbing a snack without you knowing. It is also FDA-approved. The airtight seal that this option offer will help keep food fresh for longer so that your pet can enjoy a healthy meal. It will also keep food odor contained in the vault. To make using this option even more convenient, you get a free measuring cup. We recommend you check the integrity of your purchase before using it since a few people have noted that they received their model with little cracks on the body. If affordability is on your mind, you can’t go wrong with this model as you get all the features of the more expensive alternatives at half of the price. As a plus, your food will remain fresh for longer and the odor won’t be a problem. There are countless food containers available for purchase, so picking the right one could prove difficult. With our selection of the 10 most popular choices on the Internet we hope will make your choice easier. 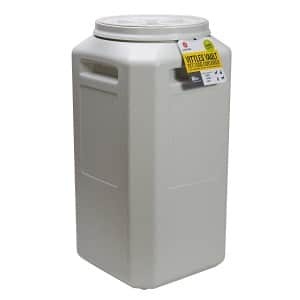 The product comes in three different sizes, ranging between 25 to 40 liters. This is a great model to stock your dog’s food and keep it fresh for a longer period of time. The airtight will seal and keep the dry food of your pooch fresh. The magnetic lid-mounted scoop will help you take the right amount of food each time, depending on your dog’s dietary habits, size, weight, and breed. This pet food storage can is made from brushed stainless steel of top-quality and features a fingerprint-proof finish to keep it shiny and smooth even after repeated use. This way, the product will also be easier to clean, and it will preserve its outer design for longer. The removable BPA-free inner bucket allows you to store the food of your pet safely. Last but not least, the item also features qualitative built-in wheels for easy handling and transportation. Thus, you can store the container in your garage or keep it in the basement. The product is sold in a wide variety of sizes, from 5 pounds to 80 pounds, depending on your dog’s requirements. A smaller bin is suitable for small-sized pooches and babies, but we would recommend purchasing a larger size, even the 80-pound one if you plan on storing larger quantities of dog food or you have more than one dog that needs to be fed. The innovative design will keep your dog’s dry food fresher for more time, and can even prolong the expiration date. In addition, the specific pet food odor will remain contained in the vault, ensuring a fresh air, free from specific animal odors. The heavy-duty design makes it easy to handle and resistant to scratches and drops. Inside you will find an airtight FDA-approved scoop to help you always take the right amount of food and feed your buddy. The patented sealing system will work wonders keeping all pests, flies, water, air, and dust away so that your dog or pet could always benefit from fresh and delicious food. This particular pet food container comes in three different sizes, ranging between 15 and 35 pounds. The 15-pound option is perfect for in-between meal snacks, while the larger containers will make a great addition if you own more than one dog or plan on buying more food at once. Thanks to the airtight system, your food will remain fresh for weeks, so that your dog can always enjoy delicious meals. The patented sealed system will not only keep the dog food fresh but will also cast inside all the specific odors of pet food and will prevent water, dust or flies from altering the taste of the food. The lightweight design makes it easy to handle and carry around so that you can store it anywhere you want. 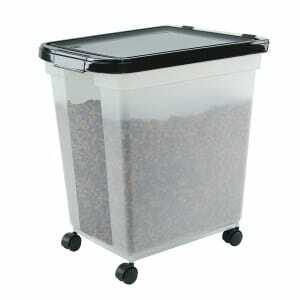 From small-sized lockers and closets to garages or basements, this pet food container will fit anywhere. Just make sure to keep it away from your dog’s sight. This airtight dog food container is made of qualitative plastic that will preserve the dog food fresh for longer. 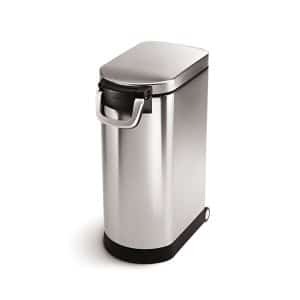 It is perfect for storing a wide variety of dry and moist foods. The larger container can be used for storing your regular, dry dog food for a healthy and balanced daily diet, while the smaller container can help you store special snacks and treats for keeping your buddy happy and loved. The product comes in a wide variety of colors, to match you and your dog’s style. You can choose between vivid colors like blue, pink, red or orange or stick to the classic black, white, or dark blue. Both pet food bins come with airtight seals and snap locks to prevent moisture and pests from penetrating and compromising the food. The set also contains a scoop that will always help you pick the right amount of food for one portion serving, looking after your dog’s diet. The products are made from BPA-free and FDA-approved materials and also feature casters for enhanced mobility. 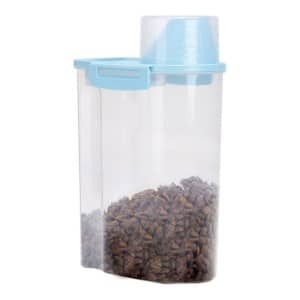 This regular pet food container is the perfect choice for a low-budget house with more than one pet. The item is sold in various sizes, ranging from 6 pounds to 54 pounds, depending on your dog’s size, breed or the number of pets you have at home. This is the perfect solution to keep your pet’s food fresh, tasty, and delicious for a prolonged period of time. The translucent body design makes it easy to always keep in control with the amount of food you have left, in order to know when you need to buy more. Thanks to the airtight seal and snap closure, you will keep pests, moisture, and dirt away, preserving your dog’s food in perfect conditions. The item is made in the United States of BPA-free materials, and also features wheels for easy transportation. The container is perfect for storing dry food and kibbles, so all you have to do is purchase the favorite type for your pet. This item is sold in two different sizes, 40 pounds and 60 pounds, and it is perfect for when you want to store large amounts of dog or cat food. Such a product works wonders if you have more than one pet, as feeding two-three dogs or cats at a time can be quite demanding. It features a qualitative airtight seal design to keep food fresh and contain the specific pet food odors inside. The easy-to-handle vault seal provides easy access to your food while keeping it away from the snoopy eyes of your pets. The resistant design makes it perfect to store anywhere and in almost all weather conditions, as long as you avoid contact with direct sunlight. The lightweight design and ingenious shape will help you conveniently store the container anywhere you want, even in small-sized apartment closets or kitchen counters. The item is made in the United States, with all materials being BPA-free and FDA-approved. The product offers a storage food capacity of 50 pounds, perfect for when you have to feed large breed dogs or multiple pets. It is also a good way to store foods if you work or own a pet shop. The item is easy to clean and is made of BPA-free and FDA compliant materials to store your dog’s food in safe and hygienic conditions. This way the food will stay fresh for a prolonged period of time. Thanks to the ingenious sealing system, all dust, pests, and moisture stay away, helping even increasing the food’s expiration date. 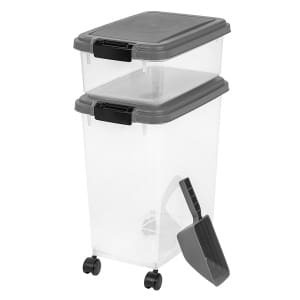 The container comes with a clear design to always know exactly how much food it is left, and also features a pair of wheels for easy handling and carrying. It is perfect for storing dry food and kibbles, so make sure you purchase the favorite stack of your dog. In order to make the most out of this container, we suggest purchasing it only after you know for sure your pet’s food preferences. The product is sold in four different colors, so make sure to pick the right one that matches your pet’s personality. It is perfect for storing small amounts of food, so you should purchase it to store snacks, cat food or food for pups. This pet food dispenser features an airtight system that seals the moisture and keeps the food dry and fresh for days, even weeks. 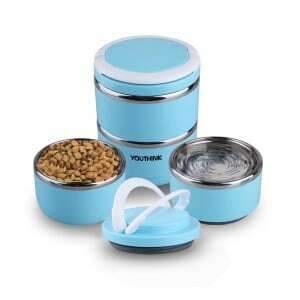 It is made of recyclable and safe plastic materials, so it is 100% safe to store the food of your pet. The item is not only perfect for storing food, but you can also use it to store your pet’s bedding or litter. The translucent design allows you to easy see through and know exactly how much food it is left. The product also comes equipped with a measuring scoop, the number one useful tool for weighing the amount of food your dog receives for each meal. The measured scoop is perfect for when you want to control your dog’s diet and make sure he or she doesn’t gain any extra weight. This is probably the item with the largest number of color combos available, so you can really pick one to match your furniture, house style or your pet’s personality and gender. You can choose from purple and blue moon to orange, pink, red, dark blue, and much more. All containers come with a clear design for easy monitoring the food levels and are made of top-quality FDA-approved and BPA-free materials. The plastic airtight container system represents the perfect solution to store your pet’s food in safe conditions and ensure its freshness for a prolonged period of time. 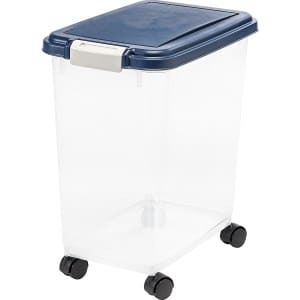 The larger container also features a set of wheels for easy transportation. The set contains two different containers, one for up to 25 pounds of dry food, and the other one for up to 10 pounds of food. This represents the perfect way to always store all of your pets’ food in one place, or provide both dry food and delicious in-between snacks and treats. This product is not designed to hold large amounts of food, but it is the perfect item for taking with you on trips and weekend getaways. If you plan an outdoor weekend filled with activities for you and your dog, you will certainly require a spill-proof water and food container for dogs. The ingenious design features two or three different layers one on top of the other to provide up to 1 liter of food and water storage. This is perfect for small-sized and medium-sized meal portions, enough to keep your dog going for an entire day. The product is made of qualitative fabrics and features a portable and lightweight design, which is easily handled and stored even in the smallest backpacks and handbags. It even features an invisible handle to allow easy carrying and transportation wherever you are – inside the house, in your car or anywhere else. The leak-proof seal will prevent spills and leaks, allowing you to carry this portable item anywhere with you. Finding the best dog food container could prove a difficult task, especially with so many products available on the market for sale today. Luckily for you, we have come up with a list of features we consider are vital when considering the best airtight dog food container. The number one aspect to take into account when searching for the best dry dog food container is the capacity of the container. Depending on your dog’s size, breed, age, and diet conditions, you can pick a container as small as a few pounds, or you can opt for large-sized items that exceed 50-60 pounds. As a general rule, most dog owners tend to feed their dogs dry food, so the large food containers are mainly designed to store large quantities of this type of food. The large-sized products are perfect for houses with multiple pets or when you’re trying to make a unique blend of foods to cover all your dog’s needs. On the other side, smaller-sized containers are mainly used to store wet food or other special treats your pooch receives on special occasions. They are also perfect for storing your cat’s food or for taking it with you on a weekend trip alongside your four-legged buddy. For more information regarding the right size of the container, we suggest going through some dog food container reviews and see what other customers have bought. The most common materials used for manufacturing dog food containers are stainless steel, glass, and plastic, each coming with their own perks and downsides. Glass food containers are heavier and harder to handle, so keeping large quantities of food in them is quite impossible. However, they work great if you have a small dog breed or a kitten and you don’t want to stock too much food. Plastic is the most common and most affordable material used for making food containers. A good dog food plastic container is lightweight and can help you store massive amounts of food, up to 80 pounds. Stainless steel is much more durable than regular plastic so it is even more trustworthy when wanting to deposit and transport large quantities of dog food. This option is often more expensive but it is completely safe and features the same hygienic storing rules as the plastic containers. In addition, they feature a classier and more elegant design, making them excellent dog food containers. No matter your choice, make sure to opt for a rodent-proof dog food container, and always store the goods on your dog’s side. Pets can be really sneaky and will often find a way to damage the container so that they could have free access to their entire food supply. Otherwise, you’ll have to implant a new dog GPS tracker to make sure your dog won’t raid the storage room, looking for goods. Another factor to take into account is the heaviness of the food container. You will want to appeal to a lightweight design such as the ones provides by plastic containers, especially if you plan on storing large amounts of dog food. You should also want to choose vertical items instead of horizontal ones if you plan on depositing the food containers in small basements, apartment closets or small kitchen counters. A compact, portable design is suitable for smaller-sized containers as well, especially on those destined for treats and snacks. 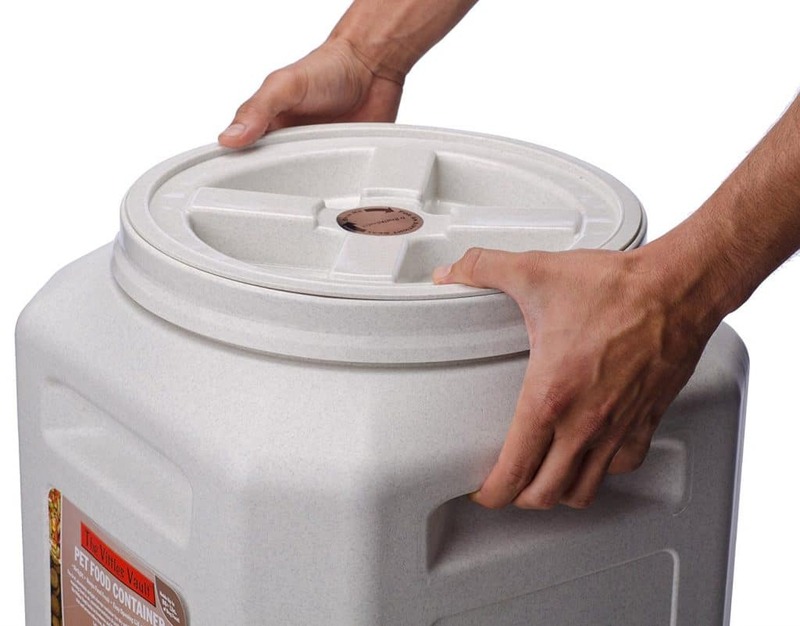 If you want increased portability, make sure the smaller-sized containers can be grabbed using just one hand, while the larger ones destined for 60-80 pounds of food come with wheels. This will ensure the food will be stored in cool and dry places and is easily accessible when you want to move it from one place to another. In the end, we suggest investing in a qualitative and professional dog food container if you want to preserve the nutritional qualities of your dog’s food. This is extremely important, especially if you’re looking for a puppy or a newborn. It is known that puppies require higher amounts of vitamins, minerals, and nutrients to develop a glowing skin, and a healthy bone system. You may even want to search for additional toys for teething puppies to prevent your pooch from trying to chew on the container, especially if you own a plastic one. The best choice is never to leave the food container unattended or to store it in places where your pup cannot reach it. A dog food container with bowls is a great option for smaller-sized containers and food dispensers. These integrated 2-in-1 systems allow you to store the food and have easy access to it whenever your dog is hungry so that you can feed him or her right away. A dog food container with scoop is also a great choice to help you easily measure the quantity of food per each serving and, thus, to watch out your pet’s diet and weight. 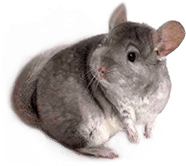 A full scoop usually carries between 20 and 25 grams of dry food which is the equivalent of a portion. Depending on your dog’s size, breed, age, and dietary habits, you will serve between one and eight portions of food per each meal. 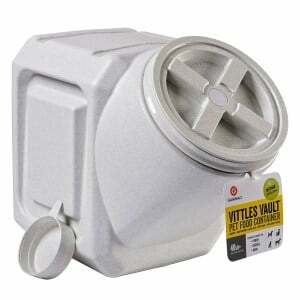 Regardless of your brand choice, the vittles pet food container you want to acquire should feature a sealed closing system to prevent pests, moisture, and air from penetrating and altering the food. It is important to invest in a high-quality sealing or vacuuming system if you want to preserve the food freshness for longer and help your dog have access to delicious and nutritious food on a regular basis. Keep in mind that the longer you leave the dog food exposed to the environment, the oftener you’ll have to replace it, even if it’s not finished. 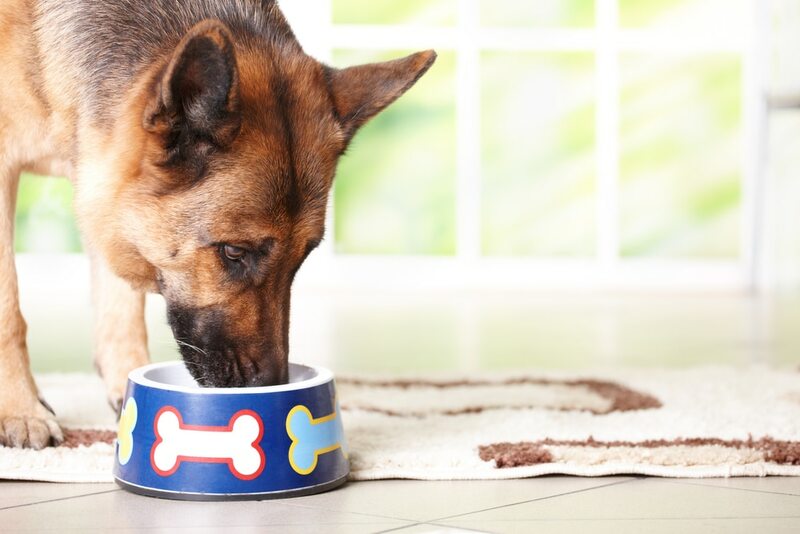 The dog food features certain vitamins and nutrients that must be consumed fresh, so leaving the food unattended or exposing it to the free environment will risk contaminating it and destroying its nutritional value. Can I make a dog food container by myself? Although not impossible, we would suggest opting for a professional-made product instead of trying your own home version. The main difference between home-made products and “the real deal” is not only the quality of the materials used but also the sealing technologies that allow the food to stay fresh and away from moisture for a prolonged period of time. So we suggest skipping the DIY tutorial on this one and purchasing a real dog food container because it doesn’t cost a fortune, but will go a long way for your dog’s safety. Are plastic dog food containers safe? Dog food containers come in countless shapes, sizes, capacities, and materials, with one of the most popular being plastic. Plastic is lightweight and is often translucent, helping you always keep track on the amounts of food stored. However, if you plan on choosing a plastic dog food container, make sure it is made of BPA-free plastic and is FDA-approved for safe use. Plastic is a popular, convenient, and affordable material, and doesn’t post any threat to your dog’s safety, as long as it is durable and features the right sealing mechanisms. What kind of product is best as a wet dog food container? Giving that most dog owners prefer to keep a dry food-based diet on a daily basis, the large containers are often used to stock dry food. Thus, if you plan on also feeding your dog wet food as occasional treats or in-between snacks, we would definitely suggest opting for a smaller-sized container. The maximum capacity should not exceed 5-6 pounds, considering that you shouldn’t feed your dog wet food more than once a day, but smaller amounts. Also keep in mind that wet dog food requires more drastic sealing and preserving features, so choose a container made of high-quality materials that will keep all extra moisture and pests away. Should dog food be stored in containers? Food containers represent the most convenient way to store dog food. This method is even used in pet shops for pets who require a blend of unique ingredients and food brands for a balanced and healthy diet. Thus, dog food containers are absolutely safe to use and, in some cases, may even prolong the expiration date of the food that would have normally been stored in bags. Another reason why food should be kept in containers is that they feature a certain odor-lock system to keep the specific pet food odors inside, which is perfect for when you’re keeping your pet in a small flat. Looking after your dog’s diet and safety should be your number one priority, meaning you should pay close attention not only to the brand and quantity of food your dog eats daily but also on how the food is stored. If you plan on offering your dog fresh and delicious food daily, there are plenty of things to take into account. The easiest way is, obviously, to provide home-cooked meals with fresh ingredients that contain all necessary nutrients. When daily cooking is not a valid option, you could opt for dog food cans. These should have an expiration date as far as possible. However, don’t assume that the dog food immediately becomes bad the very first day after the expiration date marked on the box. In most cases, if the can is stored in decent conditions, it can last even longer, provided that the package is still intact. Thus, another thing to always pay attention to is the package. If the food can is unsealed, damaged in any way or stored in improper conditions, the food inside might alter even sooner. We suggest never to purchase cans that are unsealed or present deterioration marks unless you plan on your dog consuming them right away. Remember that your dog’s food should always be stored in dry and dark places, away from excessive moisture or humidity, direct sunlight or freeze. If you want your dog food to maintain fresh for days, even months, store them in cold places such as garages or basements. If you live on a flat, try keeping them on the balcony, away from sunlight and excessive humidity. Storing food in special food containers is probably the best option you have in the long term if you want to provide access to fresh food for your dog on a daily basis. Storage food containers come in countless shapes, sizes, weighs, colors, and materials, so make sure to choose the one most appropriate for your pooch needs. If you own more than one dog, then small-sized containers are out of the question. Instead, you should opt for large containers to keep at least 30-40 pounds of food. Also, buying in bulk is always a more budget-friendly option, especially if you care about feeding large dog breeds or adults. Small-sized containers are mainly used for keeping wet food and, sometimes, even home cooked food, provided it isn’t stored for more than one-two days. When it comes to materials, you can use plastic, glass or metal bins as they will all protect your dog’s food from air, moisture, dust, and pests, prolonging its expiration date. Kibbles and dry food are the main types of food that will resist for weeks, even months if the containers are perfectly sealed.